NEW!!! NEW!!! NEW!!! NEW!!! NEW!!! NEW!!! NEW!!! NEW!!! The JMP FV-1 Flush Fuel Vent System begins with the main threaded fitting. A 3/8” hole is drilled into the fuselage and the threaded fitting is secured with the 3/8” washer and panel nut. There are two sizes of fuel line choices for the vent line, either 3/16” or 1/8” ID. This fuel system vent line attaches the internal right angle fitting to the main fuel tank vent. If you are using the FV-6 Forward Facing Vent, or, “scoop”, time the two mount holes of the threaded fitting to point the “scoop” forward. The FV-6 Forward Facing Vent, or “scoop” is screwed to the main chassis with (2) #2-56x3/32 socket head cap screws. This “scoop” is usually installed if there is excessive fuel exiting the main fuel tank vent line. This residual fuel on the fuselage is often caused by aggressive flying including inverted pushing maneuvers. Sometimes, the fuselage boundary layer near the external vent can also cause fuel to exit the Flush Fuel Vent. The FV-6 Scoop/Vent may help eliminate this problem. However, the FV-6 Scoop/Vent will make the attachment to the Overflow Tank difficult. The FV-2 Magnetic Fitting Assembly is available to attach the overflow tank line to the FV-1 Flush Fuel Fitting. If your flying style is very aggressive, a catch tank will stop vent line fuel from spraying out onto the rear fuselage. Also available is a magnetic plug and flag that can be inserted during model transport to prevent fuel leakage. Our new style Overflow Tank can receive the Magnetic Probe once disconnected from the model’s Flush Fuel Vent. The JMP External Fueling Assembly EFA-1 allows a neat filling port on the side of the fuselage. An interior manual ball valve attaches to the Air Trap Fill/Drain port, eliminating the standard Air Trap Blocking Plug. This assembly requires the FV-2 magnetic fueling probe that inserts into the flush fitting on the side of the fuselage. Just insert the magnetic fueling probe, open the manual ball valve, fill the fuel tanks and shut-off the manual ball valve. Then disconnect the magnetic fueling probe. We have finished the molds for our new Offset Hinges. These hinges are beautifully molded from high quality fiber filled plastic. All part design, material and molding are done here in the United States. The three sizes of Offset Hinges begin with the ½” pivot length, which is the same as the molded size of the past. The middle size has a ¾” pivot length. The large size has a 1” pivot length. The hinge axles are alloy steel and each set includes two mounting pads. Current models with large doors can be improved with these parts along with many other in our expanding line of accessories. Sold 6 per pack. The JMP Brake Valve is produced in two versions. The first is a stand alone design. 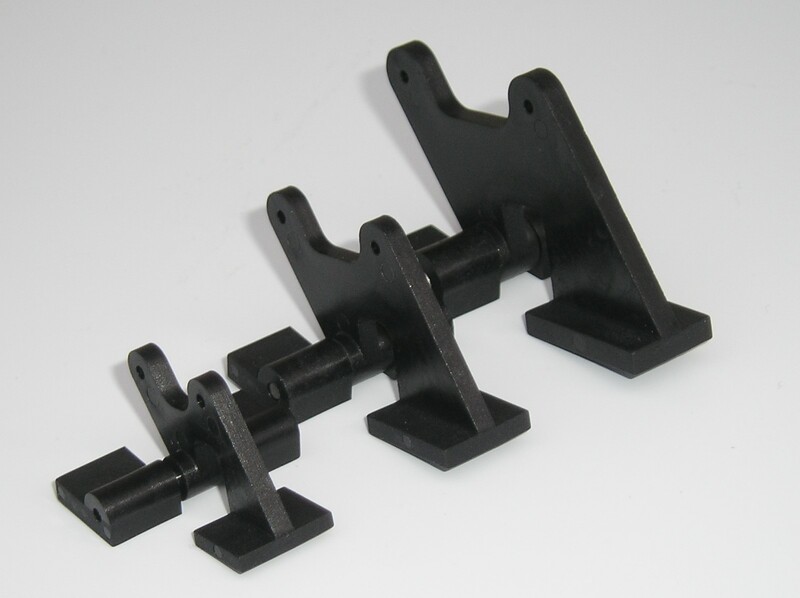 The second version as part of the JMP Multi Spool Block Valve. The Brake Valve plus 1-Circuit Block Valve would normally be used for models with retract gear and brakes. The Brake Valve plus 2- Circuit Block Valve is for models that have brakes, retract gear and gear doors. Any of these valves can be mounted directly to the control board or used with our PCU-V2 frames which also include a manifold for the gear and door air lines. The size of the JMP Brake Valve is 2”x 7/8” x ½”. The height is designed to line up with a JR 8711HV servo. Just use our Zero-Flex grommets and the standard JR two side control arm. Also available is a machined attach link to keep the install as compact as possible. Connect the brake air supply line to the “Air In” side elbow fitting and the “Air Out” fitting on the lower side of the valve to the wheel brakes. When the push rod is fully depressed, full system pressure will be delivered to the brakes. When the push rod is fully extended, the pressure to the wheel brakes is zero. All air lines for as many as three retract gear cylinders and three to six gear door cylinders can be attached to the Retract/Door Manifold. For example: Six individual air lines coming from the three retract gear cylinders can be attached to the manifold. Just decide which row of the captive nut fittings will be the retract gear up lines. The other row of captive nut fittings will be the retract gear down lines. The captive nut fittings on the front edge of the manifold will be power to the gear up and gear down rows of fittings. The other two rows of the smaller hose barb type fittings are attach points for the gear door cylinders. The Retract/Door Manifold should eliminate most of the T-fittings which mess up installations and cause pressure drops throughout the system. The manifold is usually mounted near the central and lower part of the model or to the bottom of the fuselage. All lines from the retract gear cylinders and gear door cylinders will attach to the Retract/Door Manifold. In more complex installations with multiple gear door cylinders there can be as many as 18 individual air lines. Once organized and neatly attached to the fuselage and the manifold, these 18 air lines are now only 4 air lines of sometimes referred to as 4 circuits (Gear Up, Gear Down, Doors Up and Doors Down). These 4 air lines will pass upward and attach to the operating valves on the control board. Shown in the photo the Manifold has 3 sets of retract gear cylinder fittings that are 4mm. There are also 6 sets of 1/8” fittings for the gear door cylinders. Just about any number of attach fittings and air line sizes can be ordered. We have several Retract Gear, Gear Door and Brake operating valve choices available along with a great Door Sequencer. Checkout our JMP Fill Panels in either 2-Circuit or 3-Circuit designs. These fill panels come with precision 1-Way Fill Valves and air gauges. A neat front panel and a machined mounting plate attach the Fill Panel to the model. Normally, our Tapered Filling Adapter is used with our 1-way fill valve. Also available is a 1-Way Valve with a screw in fill fitting. Used for years by quality minded modelers, the JMP Door Cylinder is now available in eight stroke lengths. These door cylinders are perfectly machined and carefully assembled with each one required to pass a “bubble tight” leak check. They are designed with a precision fixed orifice that stops the “snap action” and door slamming of other styles while eliminating the additional cost of separate restrictors. The piston rod has 4-40 thread for Quik-Link, Rocket City or ball link attach points. Available in 1/2" increments from .5” of stroke length through 4” of stroke length. Also, pictured below is the 1” stroke length cylinder with the custom machined cylinder pivot post for secure mounting. The pivot post fits every cylinder length. 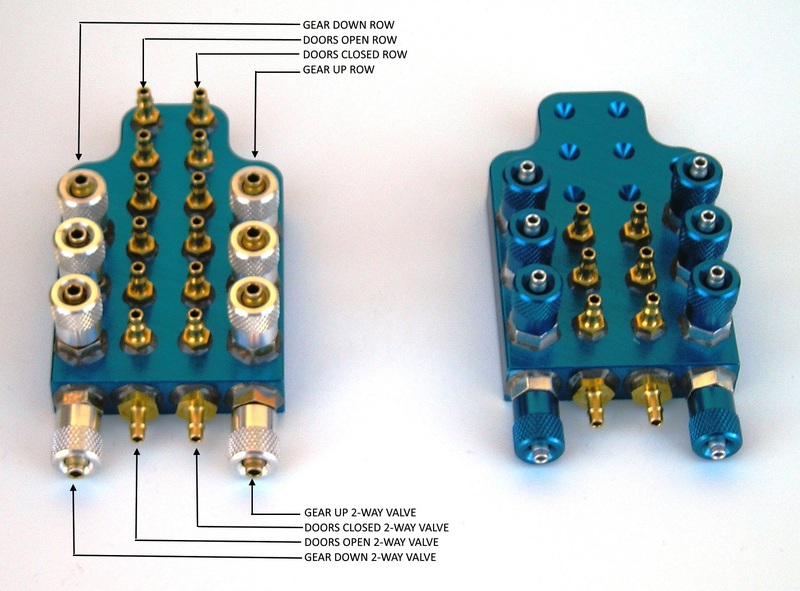 JMP’s new 2-way Hex Valve is now available. This servo controlled valve features six output fittings which will directly operate a common three air cylinder retract system. The Hex Valve will often eliminate most or all of the T-fittings. The spool design has definite end stops which eliminates over travel. This is the highest flow retract cylinder operating valve available and can be ordered with hose barbs for 1/16” i.d. air line or 4mm air line. These Hex Valves are perfectly machined and carefully assembled with each one required to pass a “bubble tight” leak check. 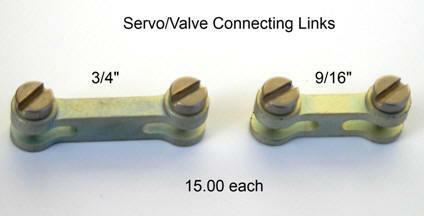 Also available is a very compact Connecting Link to finish the servo to Hex Valve connection. The mount securely holds the shut off valve to the model jet’s control board. Locate the shut off valve between the pump and the turbine engine. The Machined Mount can be purchased alone or with the shut off valve. Four sizes in either vertical or horizontal style are now available. The JMP Air Trap uses a proprietary fiber membrane to filter fuel to 10 microns and virtually eliminate air from entering the final fuel pump suction line. Smoke systems are also improved with use of the Air Trap. This design is extremely robust with properly designed end caps that deal with positive and negative pressures often found during fast fuel filling and draining. 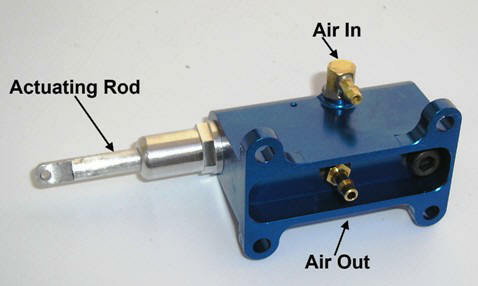 The JMP Air Trap comes completely assembled, leak checked, and ready for installation. The Air Trap has positions for two “Fuel In” hose barb fittings that can be used for twin main fuel tanks. One of these “Fuel In” fittings can be blocked if there is a single main fuel tank requiring only one fuel inlet fitting. A center hose barb fitting attaches to the fuel filter membrane. This is the “Fuel Out” position which delivers fuel to the turbine fuel pump. Also, a drain/fill line is provided. Hose Barb Fittings: The JMP Air Trap is available with hose barbs to fit either 1/8” i.d. or 3/16” i.d. tubing sizes. Many combinations of the two are also possible. Construction: The Air Trap is constructed from aircraft grade aluminum and the finest West Systems Epoxy with a main body that is translucent. It is easy to visually check for system air leaks and overall fuel system performance. Proper Filling: The fitting with the smaller hole is for the fueling/de-fueling line. Do not allow any air to enter this line when removing the fill line from the fueling station. Fold this fill line over in your hand when the tanks are full and install the plug. Very little air should show in the Air Trap when the fuel tanks are completely full. Proper Operation: Typical clunk style fuel systems found in model jets do not deliver fuel perfectly, especially when the model fuel tanks are near empty. Some air is normal to see in the Air Trap. An amount of air that would leave the Air Trap half full is not good. Either the main fuel tanks were run very low or there may be a leak upstream in the fuel system. This should be checked out. Proper Orientation: The vertical design Air Traps are normally mounted straight up and bolted to the model control board. The horizontal design Air Traps are normally mounted with the mounting tabs bolted down to the model control board. On the horizontal design, this keeps the “Fuel In” fitting to the top. If you decide to mount the horizontal design Air Trap upside down to the bottom of the model control board, you must reverse the “Fuel In” fitting and the “Drain/Fill” hose barb fittings. Drain/Fill must always happen from the lower side of the Air Trap. Just remember that air in the system must be forced up and out during the filling cycle leaving the Air Trap completely full of fuel. Available in 4 sizes and 2 mounting options! The new JMP 2-Way valve is the finest and most robust servo controlled valve built for RC models. The spool design uses quad seals with definite end stops. Its vertical design allows the air lines to remain hidden. It is truly a high flow valve and may be ordered with hose barbs for 1/16" i.d. air line or 4mm air line. The new JMP 1-Way Fill Valve is a precision machined check valve. It uses a checking concept found in expensive demanding aerospace equipment. Mounts to the model's control board using a washer and nut. The JMP Tapered Fill Adaptor provides easy connect and disconnect to the air supply. Available with hose barbs for 1/16" i.d. air line or 4mm air line. A simple but effective way to couple your air pump to the 1-Way Fill Valve. Just push the tapered nylon fitting into the valve to create a temporary seal. The air line automatically recoils, stays neat and out of the way. NOW AVAILABLE FOR 1/8" I.D. FUEL LINE!!!! These large fuel fittings are designed to minimize tank and pump pressures during fueling-defueling and running of the turbine. For 3/16" I.D. Tygon fuel tubing. Machined arms and mounts are available for the HiTec 5755 metal gear servo. These parts are designed for heavy-duty applications requiring power and holding strength. The servos are somewhat larger than standard sizes and feature an extremely large and tough gear set. This new twin vent overflow tank is designed for models with one or two fuel vents. The extra-large fuel fittings and tubing help to lower the pressure caused by fueling at a high rate. This custom fiberglass tank will deliver either turbine engine fuel or smoke fuel engine. A JMP Accumulator is embedded into the tank to save valuable fuselage space and deliver a bubble free fuel supply to the engine or smoke pump. The center baffle controls rapid fuel weight shift. A machined aluminum truss provides for easy mounting in the Hustler airframe or other similar model designs. This JMP fuel tank comes fully assembled and leak tested for the perfect fuel delivery system. Please visit the "Accessories" page for more great products.